It was a little more than five years ago that we did a Cobaya dinner at Azul restaurant in the Mandarin Oriental Hotel which included a special guest: Andrew Zimmern of the TV show Bizarre Foods, who ended up featuring the dinner on the show.There was another special attendee that night, but he wasn't very well known at the time, and he wasn't in the dining room – he was in the kitchen. 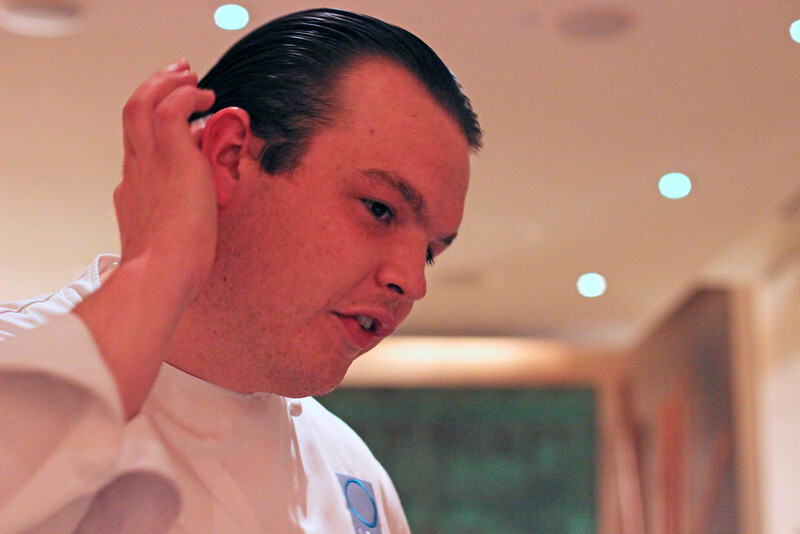 Joel Huff's sous chef at Azul was Bradley Kilgore, who had come to Miami to work at Azul after spending time with some of Chicago's finest: Alinea, Laurent Gras's L2O, Boka. Brad was actually part of what drew us to Azul in the first place, with his online updates of what was happening in the kitchen. Zimmern has a pretty keen eye for talent too, and even though Brad was third in command in that kitchen, by the end of the night Zimmern had bestowed a nickname on him: "Wall Street," for the Gordon Gekko-esque slicked-back look he sported at the time. Eager to see what Brad could do on his own, several months later a few of us organized a one-off dinner at Azul where we gave him free rein. He killed it – his "anatomy of a suckling pig" remains a benchmark for me when it comes to nose-to-tail utilization. 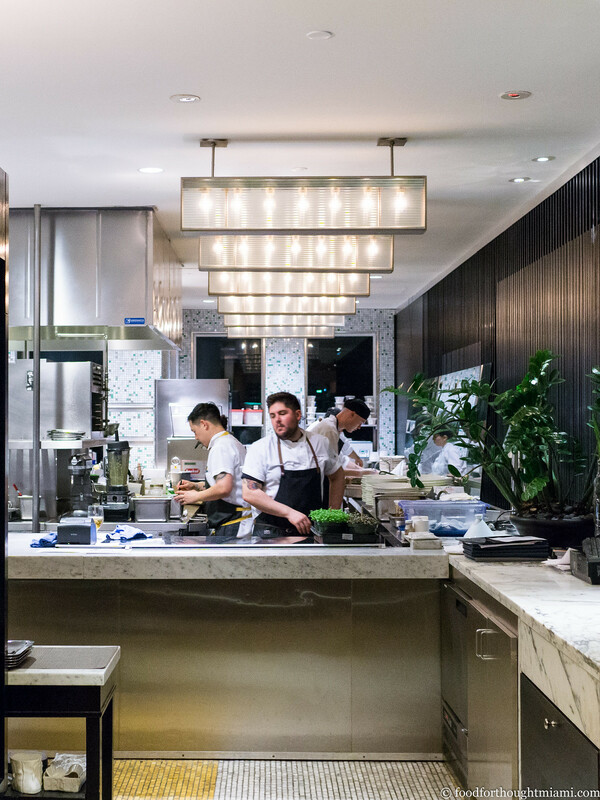 Shortly afterwards, his career path took him away from Azul: a brief gig as head chef at a tough location on Key Biscayne, then to a much better gig at the St. Regis Bal Harbour for Jean-Georges Vongerichten's J&G Grill, then, nearly two years ago, to open his own place in Wynwood: Alter. At Alter, all of his potential has been fully realized. The food is some of the best I've ever eaten in Miami, and recognition has been both voluminous and well-deserved: last year Brad was named one of Food & Wine magazine's Best New Chefs; and his restaurant, Alter, was a semifinalist for the James Beard Foundation Best New Restaurant award (a national category), and was included in Eater's list of the 21 Best New Restaurants in America. 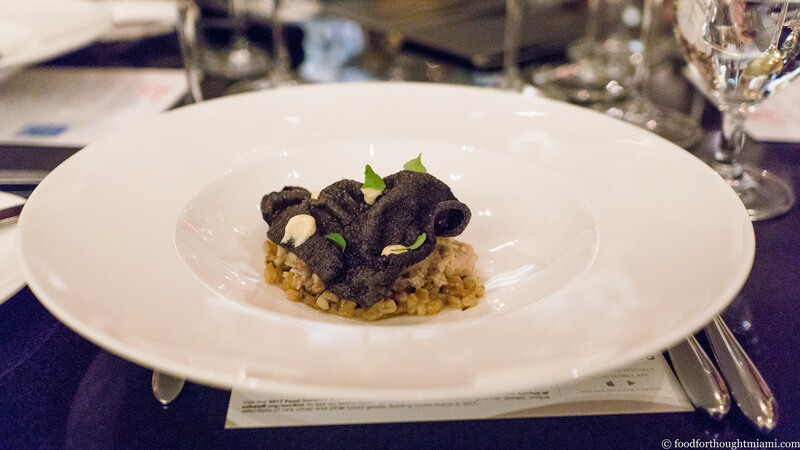 So for the third Cobaya dinner we've done in conjunction with the South Beach Wine and Food Festival, we orchestrated something of a reunion, bringing Brad back to Azul to cook for an evening. Kilgore looked pretty comfortable back in the kitchen where it all started for him in Miami, and even slicked his hair back for the occasion. 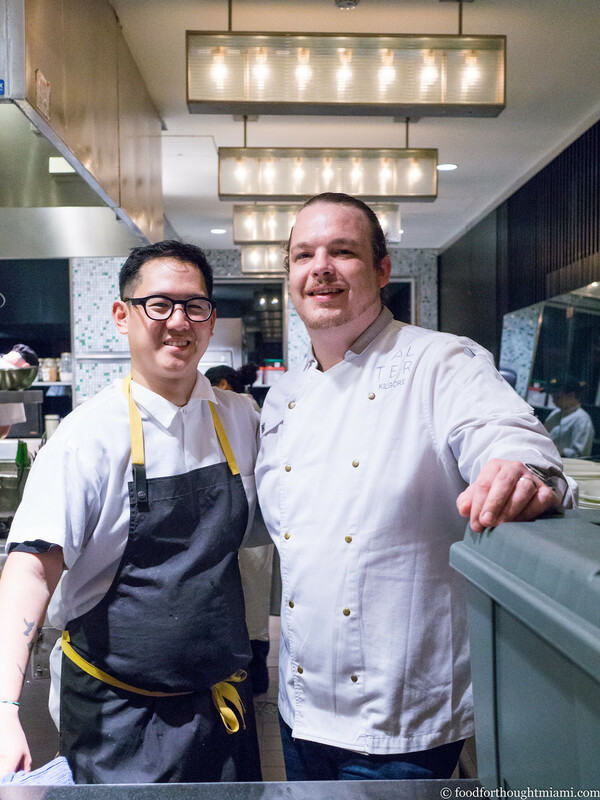 Joining him were the Mandarin's head chef, Jean-Luc Royere, and a couple New York City chefs whose careers have followed a very similar trajectory of late: Jeremiah Stone and Fabian Von Hauske, of Contra and Wildair. 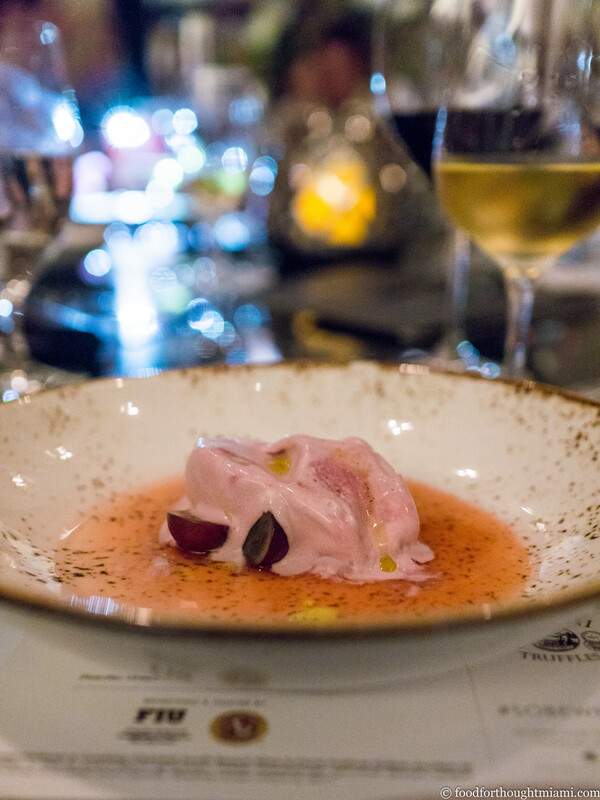 Stone and Von Hauske were also included in that 2016 F&W list of Best New Chefs; their new restaurant, Wildair, was a Beard Best New Restaurant finalist, and was on that same Eater Best New Restaurants list (their first restaurant, Contra, was on the list in 2014 when it opened as well). Kindred spirits. (You can see all my pictures from the dinner in this Cobaya SOBEWFF 2017 flickr set). 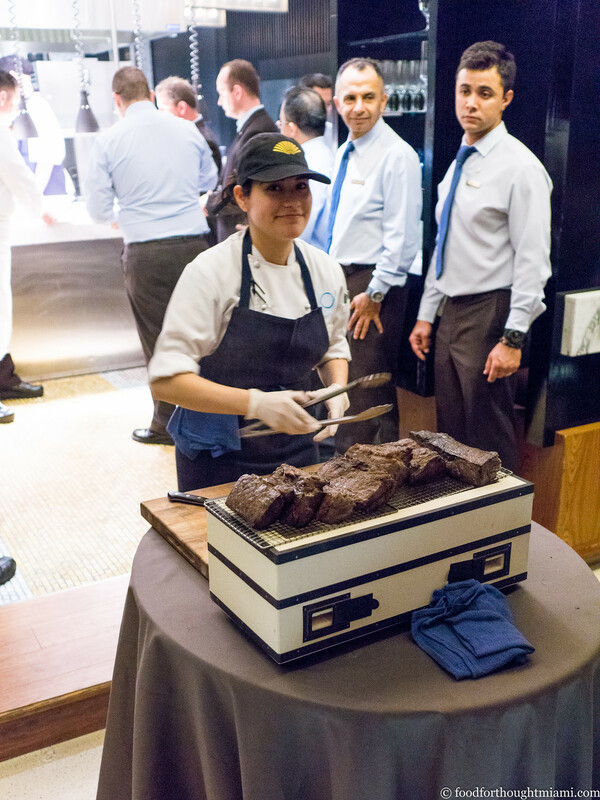 Each of the teams contributed one of the passed appetizers which made their way around the room as guests arrived. 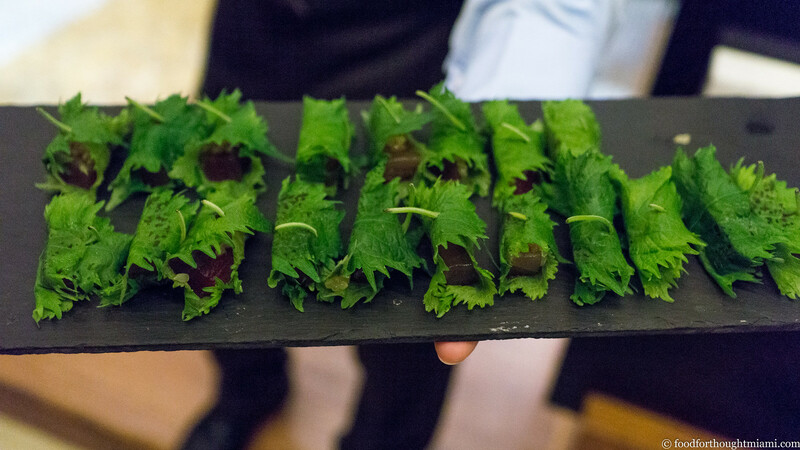 From Royere, tranches of tuna cured in kombu and wrapped in fragrant shiso leaves, concealing tiny finger lime sacs that provide a citric pop as you chew. 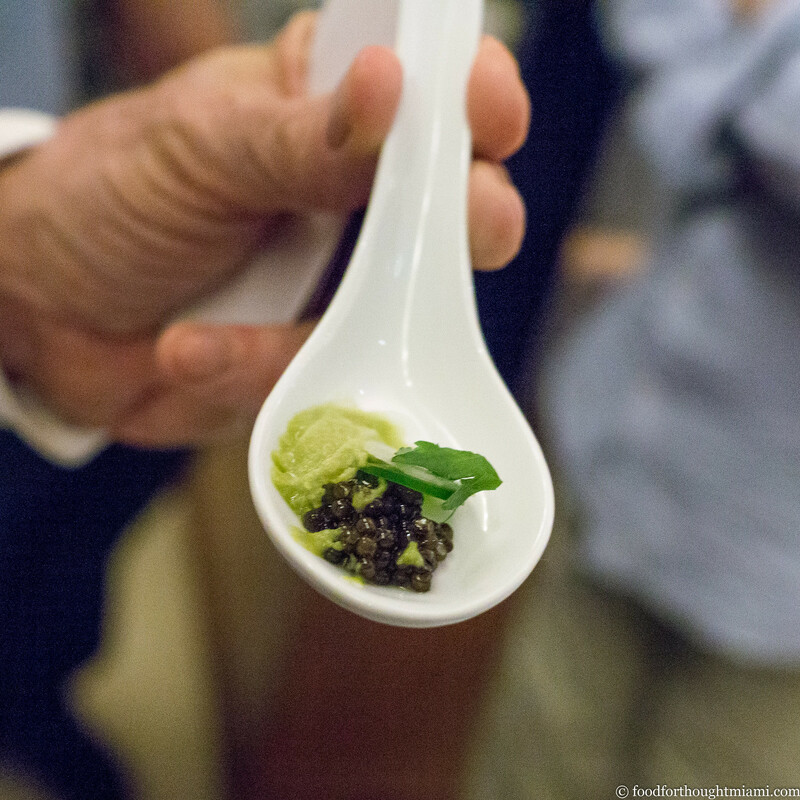 From Kilgore, a spoon of greenish-hued olive oil "snow," garnished with green apple, a sliver of serrano chili, and a dollop of caviar – a lot of flavor in one bite. 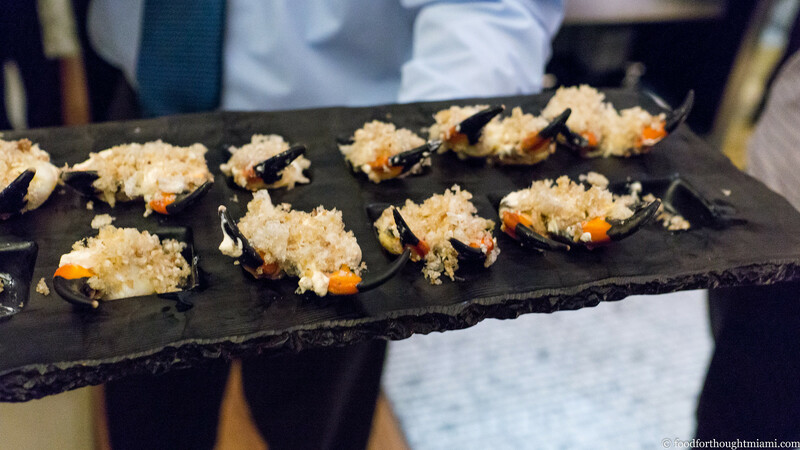 And from Stone and Von Hauske, a local specialty – stone crab claws – garnished in an unorthodox way, with smoked pepper and feathery flakes of chicharrones. 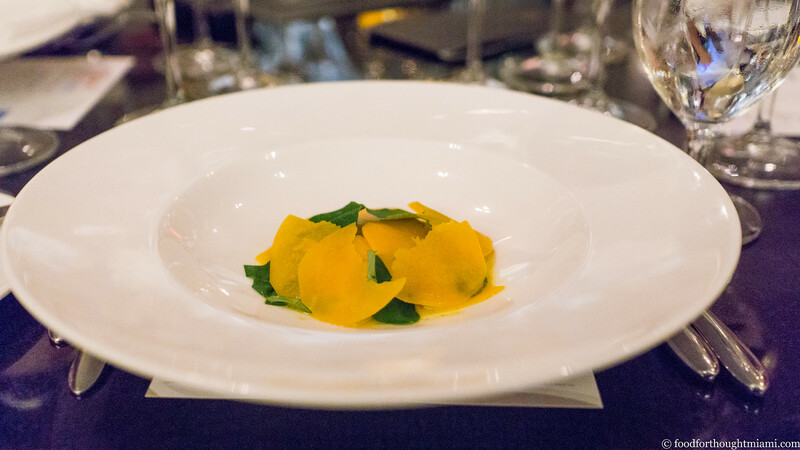 Once everyone was settled into their tables, dinner got started with Stone's course: raw shrimp and lobster, hidden away under a mosaic of thinly sliced butternut squash and sage leaves. It was an odd dish, and I say that with a fondness for odd things. The seafood was sweet and soft and fatty, the squash – still raw, or if cooked, just barely – was firm and earthy, and the sage's strong, camphor aroma cut its way through every bite. Royere's Azul crew had been tending to slabs of beef on Korin binchotan charcoal grills for a good part of the evening, and we finally got to see the result. 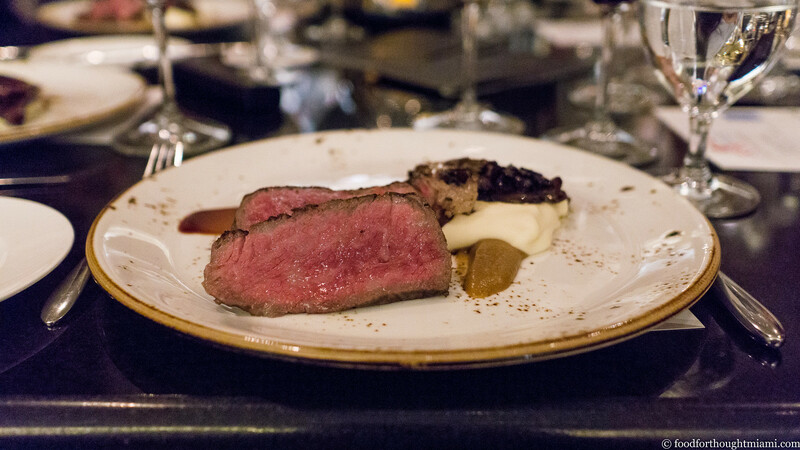 Fat, crimson slices of lush Japanese A5 wagyu beef were anointed with a miso bordelaise, and plated with roasted maitake mushrooms, a purée of golden caramelized onions, and a light smoked potato espuma. My only disappointment was that after a week of eating while on vacation (we got back from Paris the night before the dinner), I lacked the appetite to finish it. Dessert was turned over to Fabian Von Hauske, who handles the pastry chef responsibilities at Contra and Wildair. Like Stone's course, this was odd, in a good way: halved grapes and a sweet-tart grape soup (not quite viscous or sweet enough to be called a syrup), with a dollop of a rich, pink-hued coconut and grape semifreddo, simultaneously fruity and creamy and tart, dappled with some olive oil for a little extra richness. There was something particularly fitting about having Brad back in the kitchen at Azul, where he started in Miami and where Cobaya had its fifteen minutes as well (OK, not quite that, maybe ten minutes of airtime). The only one missing was Zimmern (who cooked for our first two Cobaya / SOBEWFF collaborations), though he made his own visit to Alter a couple weeks later. It was even better to have the wonderfully creative talents of Jeremiah Stone and Fabian Von Hauske sharing that kitchen, along with our gracious host, Jean-Luc Royere, and the rest of his crew at Azul (some of whom, at least in the front of house, were veterans of our Cobaya dinner from five years ago). 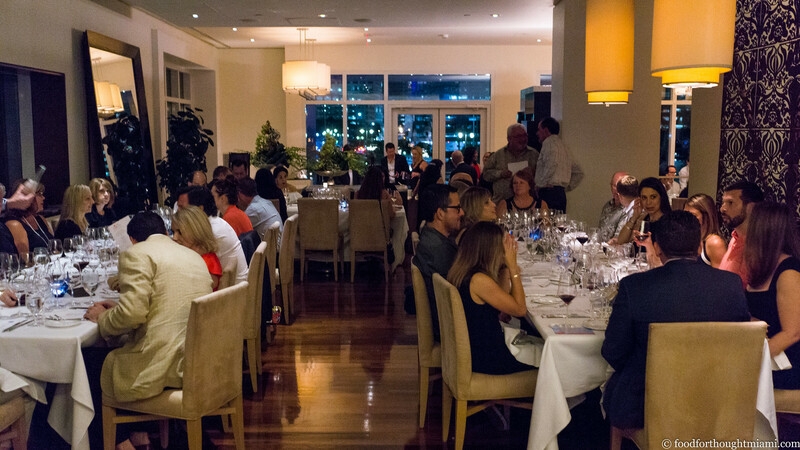 Thanks as well to Jeffrey Stambor, director of winemaking at Beaulieu Vineyards, who supplied the pairings for the evening, to the crew at SOBEWFF, and as always, to the guinea pigs whose interest and support make these kind of events possible. We were supposed to have Curtis Duffy of Chicago's Grace as well, but he backed out. In a nod to the great Quince iPad Plate Kerfuffle of Late 2016, these spoons were served from iPads which had a rotating display of logos from SoBeWFF and the chefs' restaurants. The printed menu also listed sumac crackers with blood and Flagsheep cheese, which sounds awesome, but either I missed them or they never made it out.